PPF / PPC / PPS Adjustable fork height low level order picker. Our low level order picker PP is designed for safe, effective, 1st and 2nd level order picking in heavy warehouse applications. An exceptional combination of manoeuvrability, ergonomics and flexibility, this is the perfect partner for picking and placing goods on different load carriers. A wide cab and low step-in make the UniCarriers PP a highly efficient order picker. With rapid acceleration, high top speed and gentle braking, it moves quickly between picking stations. Both robust and slender, this truck is also highly effective in narrow aisles. The lifting forks are at an ergonomic height to enable flexible picking. The elevating platform gives easy access to the 2nd level. And with the optional accompanying controls, the PPC can also be driven with the platform raised. Productivity is further enhanced by advanced ergonomic design including a spacious driving platform with comfortable backrest, adjustable seat (optional) and storage space for paper and pens etc. All perfectly located and within easy reach to give the best working position. Are you interested in the UniCarriers PPF-PPC-PPS? The low instep and the rising centrally positioned driver platform that puts the operator close to the picking location maximise picking efficiency. Combined with rising forks, this ensures good ergonomics and high picking efficiency. 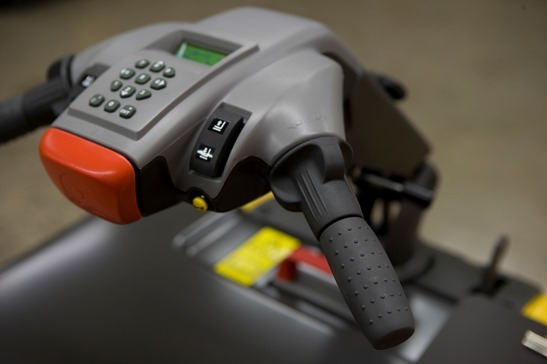 Choose rising steering equipment for driving between 2 level picking locations without lowering. The rising driver platform allows fast picking at 1st and 2nd levels. Making picking very cost-effective, the powerful AC motor gives high top speed and fast acceleration between picking locations. UniCarriers's patented 4-point Friction Force chassis automatically increases the drive wheel pressure to enhance traction in all conditions. This is particularly useful in moist environments and on slopes. This unique drivetrain technology gives the truck a smooth ride also on uneven surfaces.